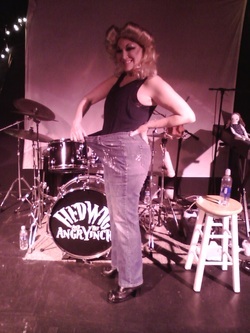 Ms. O'Donnell on the set of "Hedwig" with an old pair of jeans. Mrs. Sheff- That's right this is Dan's Mom and I have been training with my son for 6 years now. Nine months ago my doctor performed a body analysis for me. At that time I weighed 147.8 lbs with a lean body mass of 92.7 lbs and fat mass of 55.1 lbs. This past June she analyzed me again and I now weigh 149 lbs, but my lean body mass increased to 104.3 lbs and my body fat dropped to 44.7 lbs. So if I can do it so can you, so please give my son a call. Thank you! June 2014 update- I now weigh 140 lbs!!!! Loraine O'Donnell ‎ transformed herself with Dan's assistance. She recently starred in the very successful production of "Hedwig and the Angry Inch" at the ALT Theatre. And she recently received the 2012 Artie Award for Outstanding Actress in a Musical for her performance in "Hedwig." When I first entered the doors of Dan's gym over 12 years ago, I was 50 pounds heavier then I am now. I had failed at fitness at 3 other local gyms because I didn't know what I was doing and no one at those gyms seemed to care once I paid my fee. All these years later the investment I have made has brought me more confidence, a healthier physique, dramatically lower blood pressure, and TV commercial spots that I would missed if I had been out of shape. What makes Dan different is that he honestly cares about my health, not only at the gym but in my daily nutrition and over-all well being. The weekly appointments make consistency and the long-term commitment easier, because you see the results. Coming from a family that has a history of heart disease and diabetes, Dan and his workouts are possibly the best investment one could make. As the owner of a successful wellness business, I have a very high standard for the services I provide to my clients. I also have learned over the years that not every wellness professional is created equal. When I expanded my business from Buffalo to Rochester and decided to focus on the nutrition component of the business, I was faced with the task of placing my existing personal training clients with other trainers. Fortunately for me, this was an easy task because I already knew a trainer who exceeded all my expectations…Daniel I. Sheff of Cosmic Fitness, LLC. I worked with Dan in many capacities and felt completely comfortable recommending him to my clients. Dan is an expert in the field and I completely trust him to do what is best for his clients and to go the extra mile. I would recommend him to anyone looking for the best possible experience from a personal trainer! As a figure competitor an effective strnegth training program and a tailored nutrition plan are paramount for my success in the sport. Having a personal trainer/coach that offers knowledge and expertise in both is vuluable - Daniel I. Sheff is that kind of trainer. I have been working with Dan for about one year and in that time I've seen the desired changes needed in my physique to remain competitive. More importantly, for me, I have developed better nutritional habits due to his constant support and accountability.